One Month After Abduction, Boko Haram Brings Home More Than 100 Dapchi Girls : The Two-Way Just one student who reportedly refused to convert to Islam from Christianity remains in captivity. 110 girls were snatched from their school in northeastern Nigeria on Feb. 19. School girls set free by their Boko Haram kidnappers are photographed during a handover to government officials in Maiduguri on Wednesday. The kidnapping of 110 school girls from a Nigerian school in the northeast town of Dapchi on Feb. 19 came to an abrupt and joyful end for most of the families 30 days later. Early Wednesday, militants from Boko Haram, the same group that snatched the girls, brought back 104 of them, handing them over to federal officials, according to the Nigerian government. "I don't know why they brought us back but they said because we are children of Muslims," one of the freed girls, Khadija Grema, told Reuters. A total of 106 people were brought back; one boy and one other girl joined the freed schoolgirls, the government said. As for the six remaining students, "One girl is still with them because she is a Christian," Grema told the wire service. "About five are dead but it was not as if they killed them - it was because of the stress and trauma that made them tired and weak." The girl who remains in captivity is 15-year-old Leah Sharibu. In a statement Thursday, President Muhammadu Buhari's office said the "administration will not relent in efforts to bring Leah Sharibu safely back home to her parents as it has done for the other girls after she was held back by the terrorists over her decision, as reported, not to convert from Christianity to Islam." NPR reached Leah's mother, Rebecca Sharibu, on Thursday and she confirmed that her daughter had not returned, adding that the other girls reported it was because Leah refused to convert. Sharibu said she is continuing to pray. When NPR spoke to Rebecca Sharibu earlier this month, she described her daughter as "a good girl. She likes school." Rebecca Sharibu (center in pink shawl) prays in Dapchi earlier this month. Her 15-year-old daughter, Leah, is said to be the only student remaining in captivity after Boko Haram released 104 of her schoolmates on Wednesday. Leah has reportedly refused to convert from Christianity to Islam. "President Buhari assures the Sharibu family that he will continue to do all he can to ensure that they also have cause to rejoice with their daughter soon," the government statement said. Boko Haram fighters drove the girls back to Dapchi Wednesday, with shouts of "God is greatest," witnesses told Reuters. Some residents fled at the sight of the militants before fear gave way to joy at the realization the girls were back. 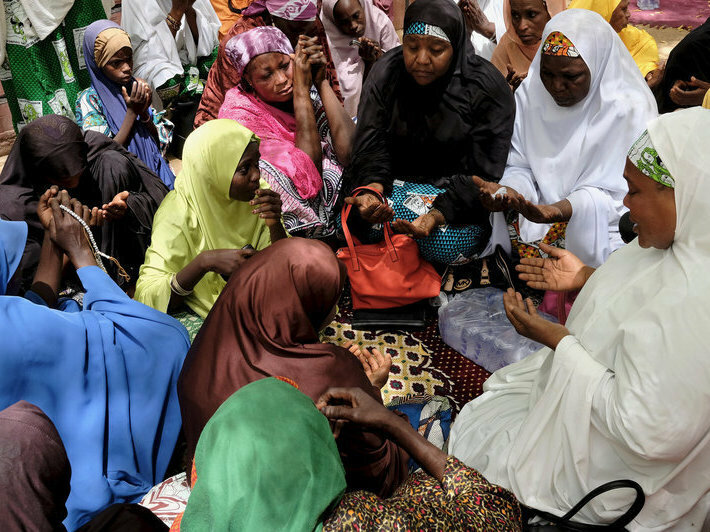 The small, sandy town in Yobe — one of three northeastern states hard hit by the Boko Haram insurgency — has experienced a rollercoaster of emotion over the past few weeks, moving from sorrow to euphoria. Makinta Liman, the father of one of the kidnapped students, told NPR by phone on Wednesday from Dapchi that his daughter, Fatima, was among those returned safely. He said he had seen 19-year-old Fatima Makinta Liman and that she and the other students were being looked after in the hospital. Fatima, a final year high school student, and her three sisters were all at Dapchi Girls Science and Technical College when the gunmen stormed the dorms, her father said. The younger sisters, Hadiza, Fatima Junior and Aisha, ages 10 to 15, managed to escape but Fatima was not so lucky. "She was looking for her small sisters at that time. 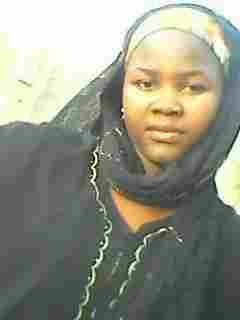 Then they capture her and take her and go," Liman said of the nighttime mass abduction. The government said the students were returned around 3 a.m. Wednesday, then were bused to Maiduguri, before being airlifted to the capital city, Abuja, aboard a military transport plane. There they were awaiting a meeting with President Buhari that is reportedly scheduled for Friday. Information Minister Lai Mohammed said in a statement that the girls were released "through back-channel efforts and with the help of some friends of the country, and that it was unconditional." 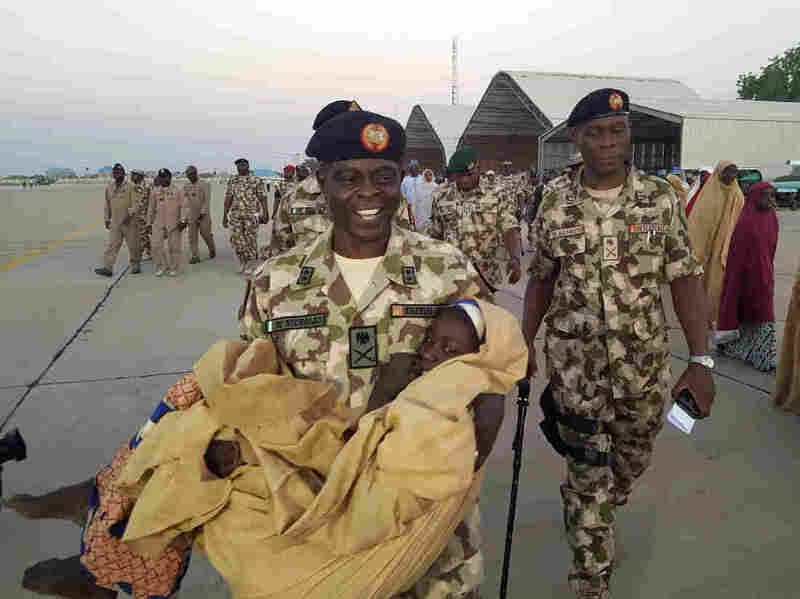 Maj. Gen. Rogers Nicholas, Theatre Commander, carries one of the freed students during a handover to government officials in Maiduguri on Wednesday. Mohammed also said the government did not pay a ransom nor swap insurgent captives for the girls' freedom. The Nigerian government has been heavily criticized for not sufficiently protecting citizens, especially schoolchildren, from the extremist group and for its initial confused and contradictory response to the Dapchi kidnapping. Rebecca Sharibu, the mother of the 15-year-old who remains in captivity, told NPR earlier this month that she feels the Nigerian authorities failed the families and must better protect schoolkids in Dapchi and all over the country's northeast. Some distressed parents have vowed not to allow their daughters to return to school. Others say they want their children to be educated, but with better security around schools. 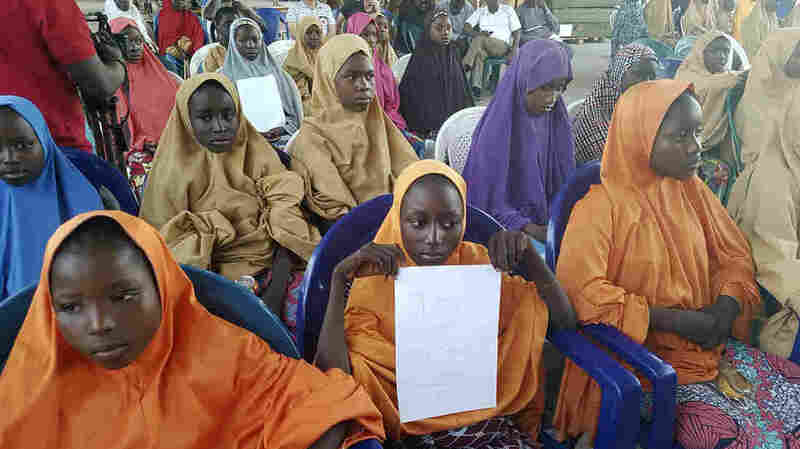 Soon after insurgents snatched the girls from the school last month, officials erroneously reported that the Nigerian military had rescued them. In the following days, President Muhammadu Buhuri vowed, "no effort will be spared to ensure that all of them are returned safely." That effort included additional troops and surveillance aircraft. Then in an apparent policy change, the Nigerian government said it had shifted its focus from a military offensive to negotiating with the kidnappers. Since its 2009 insurgency, Boko Haram an extremist group that has vowed to establish an Islamic caliphate in Nigeria's northeast, has terrorized the region, kidnapping thousands of people: men, women, boys and girls alike. The name "Boko Haram" roughly translates to "Western education is sinful." When the militants brought back the girls Wednesday, they reportedly also delivered a stern warning: "Don't ever put your daughters in school again." The Dapchi kidnapping happened nearly four years after Boko Haram abducted 276 girls from their boarding school in the town of Chibok, some 200 miles away in neighboring Borno state. That incident spurred a global outcry and a viral campaign to #BringBackOurGirls. Today more than 100 Chibok girls remain missing. On Thursday, the Nigerian government tweeted it "will intensify the ongoing efforts to secure the release of the remaining Chibok girls and return them safely to their families."